“Bunohan” is both a village in backwater Malaysia and also a Malay word for “murder”, and as it were, it is a story that opens with a vicious Muay Thai fight-to-the-death in Thailand, in which the badly outclassed Adil (Zahril Adzim) is rescued by his best friend Muski (Amerul Affendi). However, because he’s betrayed the terms of the match, Adil has to flee Thailand, and hot on his heels is hired killer Ilham (Faizal Hussein), who’s been hired by the crooked promoter Jokol (Hushairy Hussin) to kill Adil. Ilham left home as a youth, so he doesn’t realize that he and Adil actually are half-brothers. 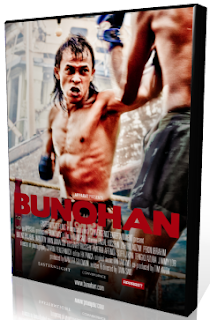 The chase takes the two men back to their village of Bunohan, where coincidentally, Bakar (Pekin Ibrahim), who is Adil’s older brother, also returns in order to look after their ailing father. Unbeknownst to them, Bakar has much darker motives than that of a dutiful son. What fates await the three men back home, when in Bunohan; home is where the heart breaks.